TwentyFeet – This is a web-based dashboard that aggregates social stats from Twitter, Facebook, YouTube and bit.ly all on one place. It pings you when events are triggered and costs less than a Starbucks “blah blah latte” for an entire year. I can see it as a handy tool for a small business or no budget situation where you want to track basic social media sites. The site is run (and funded) by a German web agency in Wiesbaden called //SEIBERT/MEDIA. SocialFlow – From the same folks that brought us TweetDeck and bit.ly, this social media engagement SaaS promises to “say the right thing to the right people at the right time” on Twitter, Facebook and Google Buzz. Scary. If it works, scary awesome. According to Om Malik, SocialFlow works by optimizing message format (hashtags + link shortening), then posts messages during your audience’s most receptive time periods, measures CTR, retweets and followers. Repeat. I just signed up for beta access so we’ll see if I can make it into the SocialFlow club. Ontolo – From the link building virtuosos Garrett French and Ben Wills comes the new Ontolo Linkbuilding toolset described by my pal Andy Beal as “Link Building on Steroids“. Ben and Garrett have been diligent and generous in getting us a view and test, which I appreciate and hope to take advantage of soon. For now, my experience is based on the free public demo and from what I’ve heard, it’s an impressive link building tool that will save a ton of time when doing link analysis. InfluenceFinder – This new link research tool makes MajesticSEO even better with wicked filtering options for link analysis. And we all know that links are the electricity that makes the Google world go ’round. The website is lite on information and heavy on the 7 day free trial, so you’ll need to sign up to get a look. Aaron Wall did a review here. Funny how all these new tools conjoin two words for their names. Afraid of a little space between words, eh? Oh, what? Ah, yes. TopRank does the same thing. Damn these companies are smart. 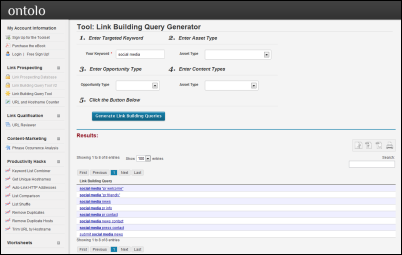 What new analytics or efficient SEO / Social Media Marketing tools have you been testing? Hi thank you for posting this, this is great content! I’ve previously worked at a company where interns were charged with updating twitter, myspace, and facebook hourly. This would be so much easier and less time consuming with twenty feet for example! I’m looking into possible tools that can be used regarding URL shorteners. URL shorteners can devalue a lot of our SEO links. WOW!!! great stuff. I search the web for useful tools everyday and I have never come across these, they are the BOMB. I’m subscribing for sure, I see major value in getting your updates. Above tools are definitely valuable , I only used twentyfeet , it’s a very handy tool to track different social media status. I checked others, Ontolo seems to be interesting, I will try it out. That’s a set of pretty wicked tool you’ve got and I might as well give it a try. Thanks! I just wonder if SEO will still be on the top of its crop as people are starting to focus mroe on CRO or conversion rate optimization — because of Google Instant’s launch. I use Reinvigorate already, great tool. 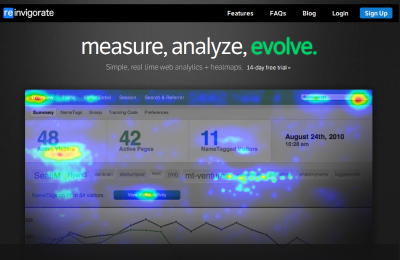 Sadly it can’t replace Google Analytics yet but it’s an excellent alternative to your expensive heatmaps analytics tool. That’s great feedback Tad, we just started testing it ourselves. What social media tools do you use on a daily basis? Don’t get me wrong, we need seo and social media tools, but it does cause a trap to open up. Too often, people will simply spend so much time using the tools that they will not actually be doing anything to further their website. I only check analytics and other seo tools about once a week and the rest of the time, I spend working on my sites. Anything more than that would drive me statistically crazy. Very interesting. I do internet marketing for a living, along with some affiliate ad smashing, and I try to stay on top of all the latest news. Only problem is, there is no definitive SEO plan. One day this works, the next this works, then neither work. You have to keep at it and try new things, and I have wondered; if you post something and say it works and a large following of people do it, does that make it actually work? If enough people start doing it will it eventually effect rankings and Google algorithms? Or are we forever chasing what we think search engines want? You are describing the efficient market hypothesis, but for SEO. Thanks for sharing these Lee. There’s a few on this list that I’ve never heard of before, but will now keep on my radar to watch. Thanks for this great list, Lee! Thanks for sharing!! 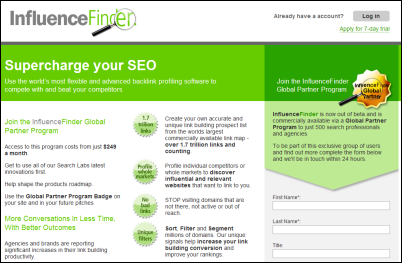 Great tools, I am defienitely going to try out the InfluenceFinder. Great resource list Lee. 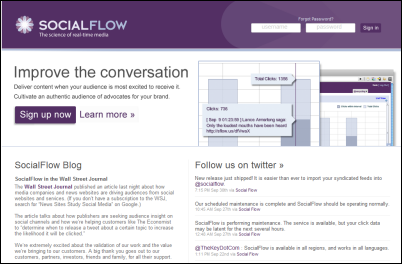 I have not heard of SocialFlow before. Have you had a chance to use it much? If so, what are your comments about it? We’re testing a number of the tools and plan on putting up reviews. First time I’ve heard about Reinvigorate, looks nice. You should also look at: Oktopost.